I showed my mom the trailer to this show last year. She was faintly amused at some of the jokes, chuckled at the Chinese market flashback, and seemed confused as to why young Eddie would identify with rap. But she lit up at the lunch scene and mentioned that when I was in school, I got made fun of for bringing Chinese food for lunch. Noodles were worms, rice was maggots, and everything apparently "stank." After a few incidents of that, I asked her for an American lunch like the other kids. I didn't like sandwiches like all the other kids did, so I asked for hot dogs. I had a mental image of perfectly charred hot dogs in a toasted bun with relish and ketchup, like from a barbecue. I did not have a great understanding of food preparation or logistics at age 6. Mom dutifully packed hot dogs and buns for me for lunch the next day. She did not pull out the grill at 7am. Cold hot dogs and buns were apparently so bad I decided after that I would rather put up with being made fun of than eat any more hot dogs for lunch. My parenting hope is that when my son goes to school in a few years, kids will have progressed far enough from when I was a kid that having Chinese food at school won't raise any eyebrows. I secretly wish I could win the startup lottery and be a stay-at-home-dad who cooks fresh lunches for his kid, like the grandfather from Eat Drink Man Woman. For the record, noodles like Eddie had go well in a cold lunch if you don't have access to a microwave. Short-grain rice with vegetables and meat works. Fried rice packed in a thermos to keep it warm does not. I can remember the smell after 30 years. It was still better than hot dogs though. I was really scared about this show after reading Eddie Huang's piece in Vulture that seemed very critical - seemed like there were more than a few compromises involved in translating his notoriously prickly memoir into a TV show. But honestly, the pilot turned out pretty great! 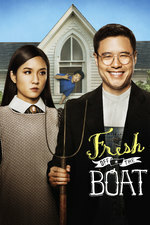 Expectations should be kept in check - this is a major network sitcom, after all - but I thought it did a great job of depicting the weirdness and discomfort of the second-generation American experience into a format that everyone can understand. The way it upends the typical white suburban perspective is funny and affirming, and I can see the show going to some pretty risky places once it establishes a voice. I also love how meaningful 90's rap is to the show. Misfits and society's outsiders will find each other. That much rings true to my own (second-generation Indian-American) experience. My dad's girlfriend until they split up recently was Chinese, and moved to NZ with her daughter to live with him. I've had the chance to see NZ through her eyes, seen how important Chinese School for her daughter was to her, and sometimes seen how she saw westerners as lazy, fat and not interested in education. Eddie's mother cracks me up from that perspective because it's the lighter version of that disconnect between cultures. The "chink" moment in Ep 1 made me really uncomfortable, moreso because I have family for whom that's everyday language when they talk about the large Asian population in NZ and all the various stereotypes. So the show is funny for me, but difficult to watch. I love the little family moments more for that reason -- there's a scene in Ep 3 where the parents touch hands and the kids are all "...EWW" -- they're just a family being a family, with no cultural baggage weighing over them.